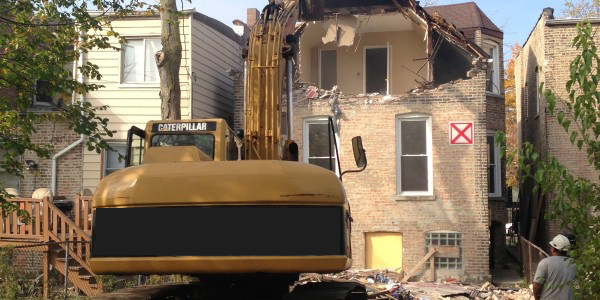 House demolition is a relatively straightforward and uncomplicated process. However, that doesn’t make it any less intimidating if this is the first time you’ve decided to remove a structure. If the thought of tearing down a house makes you want to run away screaming, fear not. 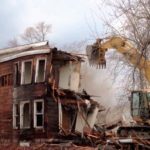 At Just Take It, LLC, we’ve compiled a guide of 10 steps to demolishing your house. Determine which demolition method is right for you. There’s more than one way to take apart a house, so the number one on your to-do list is to decide which type of demolition is best for you. 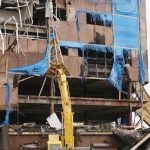 This is the most common form of demolition—the act of simply tearing down the house with the help of hydraulic excavators and other heavy machinery. The resulting debris is then hauled away via trailer or dumpster. Mechanical demolition is the cheapest and fastest solution, costing between $4,000 and $14,000 on average. Also known as “demolition by hand,” deconstruction is the process of manually stripping and deconstructing the house piece by piece with the intent of salvaging as many of the materials inside the home as possible. According to the Environmental Protection Agency, deconstruction projects can recycle or reuse more than 70% of building materials, such as lumber, beams, doors, windows and more. Because everything is done manually, deconstruction takes much longer and costs significantly more than typical demolition methods—sometimes twice as much. Interior demolition crews individually take off doors, light fixtures, sinks, tubs, copper pipes, glass from windows…even the nails in the floorboards can be removed and recycled. Because of the additional labor involved, expect to pay 2 to 3 times as much to deconstruct your home rather than demolish it. The most highly recommended form of demolition is the combination of deconstruction and demolition. This includes the act of deconstructing the house first by going through and salvaging a portion of the reusable materials. Once all desired materials capable of being saved and reused are collected, the remaining structure is then demolished, and remaining debris is hauled away. This is a great solution for those who want their demo process to be efficient, affordable, and environmentally responsible. Let Just Take It, LLC help you choose the best way to wreck and remove your house. They will meet you at the site and go over possible solutions. As demolition experts, they’ll be able to thoroughly discuss your options. Get proposals or estimates in writing. Have your home inspected by a professional. Ask your Just Take It, LLC what the inspection requirements in your area are. If the home contains asbestos or lead paint, proper procedures for remediation need to be followed. A permit will typically need to be pulled prior to starting the demolition. This is available at your local City Hall; check your city’s government website for more information. The exact permit(s) necessary will depend on your local and state laws and regulations. BEWARE: Electricity and gas pose a particularly dangerous health risk if still active when demolition takes place. Surrounding supply sources can also be damaged if services have not been properly terminated. Neighboring homes can be at risk of losing services, and local power, gas, water, or drainage infrastructure can be affected, too. Ensure that the area is safe for others. In addition to shutting off utilities, make sure adjacent buildings and walkways are protected by putting up debris-containing temporary fencing, like the kinds shown above. Helpful Hint: It also doesn’t hurt to have a conversation with your neighbors before the mess and noise start up. Let them know of the work being done. Having the patience of your neighbors will only make the demolition process easier. If you have any salvageable materials in the home, work with your contractor to recover recyclable or reusable materials that can be resold or donated. There are several organizations and charities that can assist in the deconstruction of a house, often times free of charge. This can take anywhere from one day to several days. 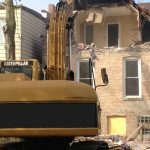 Home demolition generally involves a large, hydraulic excavator tearing down the house and putting the unwanted house materials into the back of a truck or dumpster. However, if are choosing to go the route of deconstruction—whether partial or complete—this process can take much longer. Remove all demolition debris from the site, leaving the site clean. Typically, this means the removal of everything “down to the dirt,” including removal of the house’s foundation. If you’re rebuilding on the same site, your demolition contractor can often times use much of the same heavy equipment to prepare your site for the new house, whether grading or basement excavation is needed. When Do I Need a Demolition Company?